A direct debit and standing order is a service provided by the banks to their customers. It is a premium service provided by the banks to those who want it. Both services make monetary transactions easy to the customers. A direct debit is an automatic payment system in which a payee is authorized by the payer to withdraw money from payer's account. It means a payee has a legal right to draw the amount when the amount due from the payer's account at a certain period. In an advance, a bank account holder gives an instruction to a bank about timing and amount of withdrawals to the particular payee. A payee can withdraw any amount at any point of time but the control remains with the payer only. If anything changed between payer and payee, a payer can inform bank and has right to stop or cancel the payment. In direct debit, the monetary amount varies from time to time. A standing order is also known as standing instruction or a bank's order. In standing order, a payer can instruct a bank to transfer specific amount from his account at regular intervals. In standing order, an instruction is already given to the bank by the payer to transfer a certain amount to the payee's account at a regular interval. A standing order facility is suitable to those payments which fall due on fixed time with a fixed amount. It means a monetary amount remains the same. Direct debit is a service of payment in which a bank account holder can authorize the customer to withdraw the due amount directly from his account. 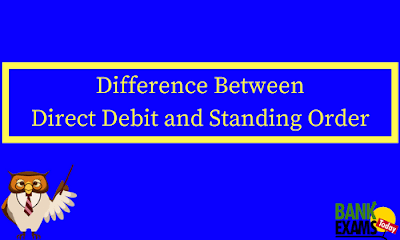 Standing order is an instruction given by the bank account holder to a bank to pay a fixed amount at an intervals to another person’s account. In standing amount, a transfer amount remains same all the time. A direct debit is a complex by nature. Standing order is simple by nature. A payee has a total control on the payment. Opposite to the direct debit, in standing order a payer has control on it. Bank charges a low amount of fees for this service. Bank charges a more fees as compared to the direct debit. Direct debit is fast service. Standing order is slow service as compared to the direct debit. In case if the transaction failure by the payee, the bank will send notification. There is no notification at all in any case.